We lost it in a wicked June storm. Thankfully, it didn’t land on the house when it blew over. It was my favorite tree to photograph as Fall arrived because its color was spectacular. Our yard still looks naked without it. This entry was posted in Seasonal and tagged autum color, fallen tree, maple tree, storm. Bookmark the permalink. Awwww. I HATE losing trees. When one (or more ) have to come down here I have to leave the house. My mom was the same way. I’m sorry you lost such a beautiful tree. Thanks, Dawn. Domer was stunned when I texted him a photo of it lying on its side. On a brighter note, at least it didn’t topple over onto the house. I’m so sorry, Debbie. It surely is a gorgeous color in that photo. Losing a tree is always sad. Thanks for empathizing, Audrey. Domer was just a wee lad when we planted it, so he always kind of thought of it as “his” tree. The yard just isn’t the same without it. I’ve been looking into replacements, though, because we need a shade tree there! Boy, the year has flown. Hasn’t it, John?? It feels like just yesterday that it blew over. Where has the time gone?!? I remember when you posted about it. So sad – such a beautiful tree. Thanks, FF. It was beautiful in every season. Hard to believe a whole year has passed since then. I’m amazed that a year has passed, too. And I’d forgotten how truly beautiful it was. Wasn’t it the Victorians who practiced a year of mourning after a death — the black, and draped mirrors, and all that? If so, it’s time to get planting! You know, Linda, I find it very interesting to read about the various practices surrounding mourning. So much has changed over the years! It used to be that no one would even dream of wearing flowered prints or bright colors to a visitation, but I’ve noticed lots do now. And even snow boots in winter and Capri slacks and flip-flops in summer!! But I think you make a wonderful point — ’tis time to start planting. I’ve been doing some research into what kind of tree to put near that spot, and I’ve just about narrowed my options. I don’t want to plant in the summer months, but as things turn cooler, perhaps we can start growing a new tree for me to baby, ha! And I can certainly see why Debbie, what a gorgeous tree! 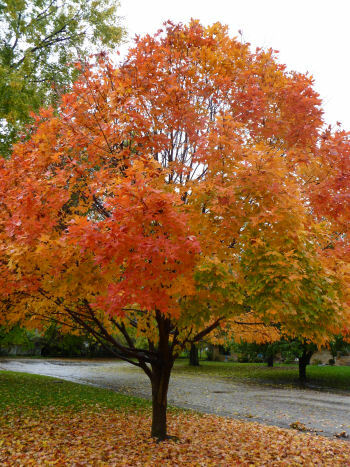 As you know Fall is my favorite season, and for the reason you stated….all of nature’s STUNNING color! I always think of a tree as being a human being with feelings and emotions; therefore when it’s no longer there, I feel such a loss, as if it were someone I knew. I like Linda’s idea about maybe planting another tree; perhaps even in the same place so that you can watch it grow and thrive. Thanks so much, Ron! Trees are special, particularly when it’s YOUR tree and you’ve worked extra-hard at tending it — watering, trimming, and so forth. I love the idea of planting another tree , not that it could take this one’s place but that it could give me another chance to mother something and watch it grow, ha! Here’s to a wonderful weekend — hugs to you! What a beautiful tree. So glad you commemorated that by creating an everlasting memory of it that gorgeous photo. And glad it didn’t hit the house. Thanks, Pat. You know, it came pretty close! I don’t know what we’d have done if it had shattered a window and spilled forth a nest of squirrels, ha!! Such a glorious tree, Debbie. That’s so sad. I think trees are such gifts, they save us so much in this hot Texas sun. It is such a shame to loose one. I do hope you plant another, maybe even a different type. I’m definitely looking at another type of tree. While this one was indeed beautiful, it must have been “weak” … or maybe it just got struck by lightning. Whatever, it’s sad to lose one this way, and I appreciate your empathy! Many trees in my neck of the woods get struck by lightening. We have such violent storms here. Very sad. We do, too! Seems they have a straight shot at us, rolling across the prairie the way they do. Thanks, Kim. Sorry to bring you down like Domer’s tree, but we’ll find a new one to plant and watch it stretch its branches toward the sky! It sure was a beauty. Aren’t trees such fabulous creatures? I’m sitting beneath one now sipping my morning cup of coffee and enjoying it’s slow movement in the early breeze. Thanks, Barb. It was beautiful, and we sure feel its absence … especially when the summer sun beats down on the house with nothing to block it. I’ve got to find a new tree for that spot!